Kim Simmons, a bellringer for the Salvation Army, greets people as she collects money in her red kettle on Giving Tuesday, Nov. 28, 2017, in Hallandale, Fla.
Belk, like Ebenezer Scrooge on Christmas Day, has seen the error of its way and reversed its decision to ban Salvation Army bell-ringers from its department stores. “When our customers speak, we listen,” a company spokesman told the Todd Starnes Radio Show. “And our customers have been loud and clear about their passion for the Salvation Army. Let’s just say Belk customers made a social impact of their own — many taking to Facebook and Twitter to voice their extreme displeasure over the bell-ringer ban. 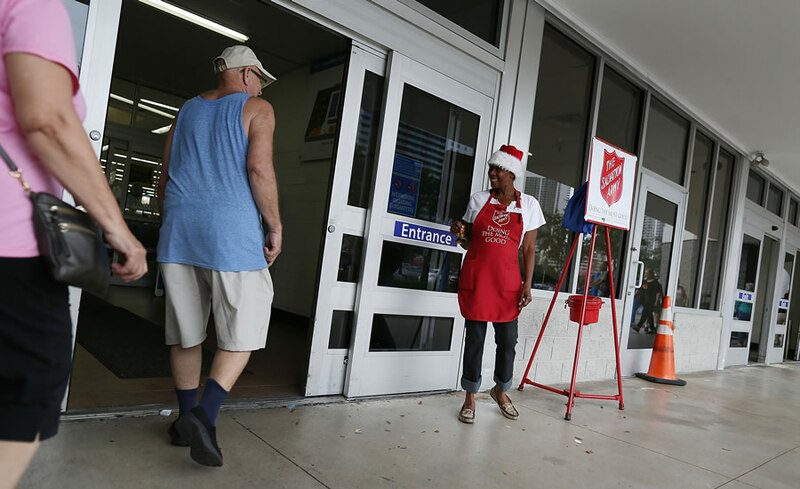 The Salvation Army had been caught off-guard by the department store’s initial decision to ban bell-ringers from outside the stores — predicting a loss of about $1 million. “We believe that a lot of Belk’s customers align with the Salvation Army’s views. We believe in saying ‘Merry Christmas’ because we believe Jesus is absolutely the reason for the season,” Lt. Rob Dolby, of the Salvation Army, told the Todd Starnes Show. And the future — happens to be now. So the bells are ringing, the coins are clinking in the red kettles and Belk has found the spirit of Christmas. It’s like a Hallmark Christmas movie. God bless us, everyone — indeed. Todd Starnes is host of Fox News & Commentary. His latest book is The Deplorables’ Guide to Making America Great Again. Follow him on Twitter @ToddStarnes and find him on Facebook. The Salvation Army might be the most impactful Christian group in the world. They deserve our love, respect and support.